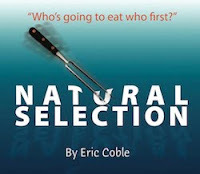 When I saw Eric Coble's "Natural Selection" at the Humana Festival a few years ago, I was quite taken with it. I'm not sure if it was the Navajo mythology about the end of the world, the engaging actor (Jay Russell) who played the main character (Henry Carson, a hapless curator swept out of an Epcot-like "Culture Fiesta" and into a metaphorical as well as literal hurricane), or Kris Stone's huge, spectacular sets that sealed the deal, but whatever it was, I was happy to go along for the wild, wonderful ride that was "Natural Selection" in Louisville. Yep. I called it a "wild, wonderful ride" in my original review. So I was curious how Illinois Wesleyan's Theatre Department and director Allie Beckmann would fit Coble's oversized experience into the black box confines of the E. Melba Johnson Kirkpatrick Laboratory Theatre. The good news is that Beckmann had a strong vision that informed her entire production, and her message -- that technology and separation from nature are turning us into robots -- came across loud and clear, even without all the quotes that said exactly that in the program. The message was telegraphed the first time Neil Stratman, playing our hero Henry, moved his arms or took a step. With peculiar straight-arm gestures and funny little shuffle-steps, this Henry moved like a Ken doll. Marlee Turim, who played Henry's wife, a character who blogs her entire life even as it's happening, was much the same. In contrast, the maybe/maybe-not Navajo who throws Henry's life into chaos, played by Roz Prickel, was much more fluid and human. Aha! She represents life and the force of nature, while the Carsons are about being stuck in a plastic world of technology. Or, you know, Barbie's Dream House. Not that Lindy Randall's scenic design was anything like Barbie's Dream House. Randall's sets were a whole lot smaller and less spiffy than Rose's design for the Actors Theatre of Louisville, of course. Randall used basic boxes and a few platforms to create playing spaces for the actors that were versatile enough to get the job done and prove that you don't need an actual helicopter to stage a battle in one. Coble's message about technology might've played even better with a little more of it on-stage, but still... It worked. The best thing about this production may've been the humor. Even in a pared-down production, Coble's script came off funny and fresh, and IWU's undergrad actors found the laugh lines just fine. Beckmann chose to make Zhao Martinez, the wily Navajo trickster in the center of the hurricane, a woman for this production. I'm not sure that is totally successful. Specifically, there's a scene where Henry should be a little jealous that Zhao is tangled up with his wife, plus some tension about who is and isn't a "real man" and Zhao's indentification with the Coyote of Navajo mythology, who has womanizing among his traits. None of those elements came across very well with Zhao as a woman. But it was an intriguing choice, at any rate. Beckmann has also gone with a cast of nine, instead of the six she could've gotten away with, and she's changed the gender of a minor character. No worries there. The key here is that the play is still provocative and entertaining, and it may even send you out of the theater looking for information on Navajo mythology or changing how you think of theme parks and the virtual world. One can only hope. Note: The poster which appears with this entry is not from Illinois Wesleyan's production of "Natural Selection." It's really cool that you saw it at the Humana Festival and can compare the original version with this production. Enjoyed the review very much, wish I could see the performance! Thank you for your favorable review on Allie Beckmann's "Natural Selection" at IWU. I saw Allie's version of "Natural Selection" (I'm her mom) and we were thrilled at her success. Just an inside scoop on the "choice" of a female Zhao: Allie had to choose her cast at the same time 2 of her professors were casting their plays and males were much in demand for one of those. She had to bargain hard for her male cast and her 2 top choices for a male Zhao were taken by the professors. While sorely disappointed with the outcome, she was up for the challenge by using a strong female actor. We are so proud of her success as a senior actor and director and her post-graduation acting as well.